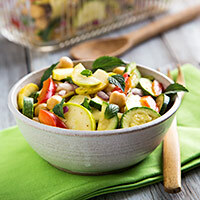 This fresh, almost raw zucchini salad is quick to make and improves with age. 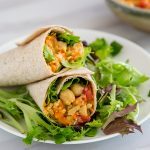 Chickpeas make this under-200 calorie dish more filling! This summer I may have to start a new blog, one devoted to one-pot meals that require little to no cooking. Because I’m just not feeling it–the desire to cook, that is. I still have the desire to eat, of course, but even that has been slightly withered by the crushing heat and humidity of Mississippi summer. So there have been a lot of salad days (and nights) lately. I’m practically living off my Spicy Apple-Walnut Salad! Um, I’m not exactly sure what kind of squash this is, but I’ve decided to call it a squashini. [Update: Thanks to everyone who wrote to inform me that these are Zephyr squash.] I found it at the farmers’ market and just couldn’t resist its two-toned color, as though someone had taken a yellow squash and dipped its lower half in green food coloring. 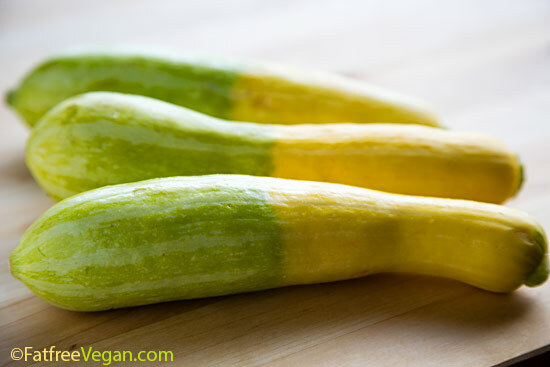 I combined one of these mystery squash with three small zucchinis to make up the pound of summer squash I used in this recipe. Lately I prefer my summer squash uncooked; when it’s shredded or spiralized, it becomes tender and noodlelike, but when it’s sliced, it’s tender yet also keeps its “snap.” So I sliced the squash for this tangy salad, which is so ridiculously easy, especially if you use canned chickpeas, that you can have it ready in 15 minutes. The only catch is that it really tastes best after it’s had a chance for chill for at least 24 hours. The acid in the lemon juice and vinegar works on the zucchini to slightly soften it without cooking. But if you just can’t wait, you can eat the salad after 6 hours; the perfectionist in me just wants you to enjoy it as much as possible. Before I get to the recipe, let me show you the top of the cute refrigerator dish in the background of the photos. One of my hobbies is looking for bargains on vintage or unusual dishes; a vacation just isn’t complete for me without a visit to the local antique or thrift store. I was in Ruston, Louisiana, last spring break when I saw this adorable refrigerator dish with asparagus, tomatoes, and corn embossed on the lid, and being the veggie-lover I am, I had to have it. Unfortunately, it only holds about half of the salad that this recipe makes, so it was really only useful for storing the leftovers–and taking these photos. This is one of those salads that I like best unadorned, just the clean flavors of summer squash, onion, garlic, and lemon. But feel free to add fresh herbs or follow one of the variations listed at the end. And do make it a day ahead of time so that the lemon and vinegar have time to “cook” the zucchini. Combine all ingredients in a non-metal container. Cover tightly and refrigerate for at least 6 hours (24 hours is optimal), stirring occasionally. Check the seasonings and add more salt and lemon juice or vinegar if you think it needs it. Serve sprinkled with additional fresh herbs. 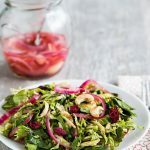 While regular white wine or white balsamic vinegars can be used, for best flavor, use a vinegar with some sweetness to it, such as fig, raspberry, walnut or pecan. Add a teaspoon of sesame oil and some toasted sesame seeds for an Asian variation. Add some spice by skipping the herbs and adding cayenne pepper or your favorite hot sauce. Add some fresh sweet corn kernels for a complete one-dish meal. Each serving is zero Weight Watchers points. I was just looking for another salad like this. Central Texas summer has me not cooking either. I have zucchini in the garden … 🙂 Thanks Susan. This is inspired!! It’s beautiful, easy, healthy and yes, I am so making it!! I totally agree with you about loving uncooked zucchini and I can just see how letting this slowly marinate will make the flavors pop and sing. Can’t wait to try it. I really LOVE the refrigerator dish–it’s so cute! 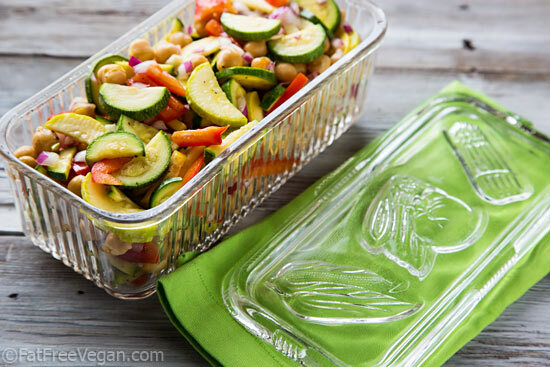 I like to store my leftovers in glass and I have one from my mother similar to this (but not as cute, no embossed veggies on the cover) that I use regularly. It’s fun to find little treasures like these in thrift and antique stores. Cool hobby! I love the two toned zucchini. That’s a gorgeous photo of them. I think I may have seen something similar at our farmer’s market. Now I’ll know just what to do with it, an all the extra zucchini there will be from everyone later in the Summer here! This looks absolutely delicious! Thank you! The 2 tone squash is a Zephyr squash, an heirloom variety. I have a couple plants in my garden this summer. They’re extremely prolific and hardly. Thanks for letting me know, hollyn! You’re so lucky. I’d love to grow some, but squash is the one thing I find almost impossible to grow. The squash vine borers destroy my vines every year, so I’ve just stopped trying. This year I hope to have a bumper crop of cucumbers instead. Looks delicious and that cute little dish looks like my grandmother’s old butter dish. Susan, does using freshly squeezed lemon juice make a lot of difference over the bottled stuff? I’ve never really had lemons on hand but I was just wondering if you found it made a difference in taste? As soon as I saw this recipe, I recognized the dish in the photo. I inherited mine from my grandmother, and unfortunately I broke the bottom part, but I still have the lid! And the salad looks wonderful — something I will try this weekend. I’m with you about not wanting to cook when it’s so hot out – but I still want to eat! We have been also enjoying lots of salads and anything I can double up on and have cooked ahead to just heat and eat. Last night I made your Cuban black beans and plantains – delicious and so filling and we have leftovers for tonight. Thank goodness for leftovers. Looks so light and refreshing – what a fab combo for this steamy weather. Sometimes, the simplest foods are the tastiest. Unusually, we’ve had over a week of hot weather here in the UK! I prepared this salad this morning before we cycled to the beach for the day with a picnic. It probably had 9 hours marinating and was absolutely delicious. 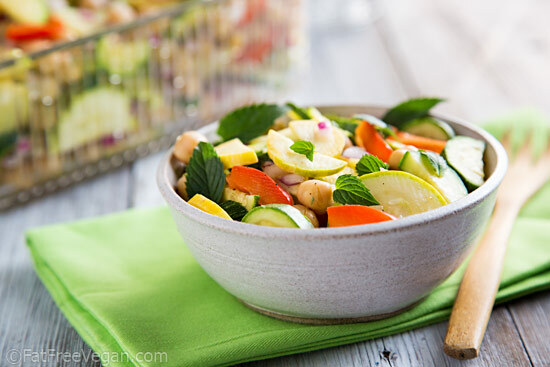 I’ve got both green and yellow zucchini growing in the garden and added a little fresh mint too – thanks for such a yummy way to make sure the produce gets used! I Made this salad yesterday to take to a potluck today. I added 3 small red potatoes cut into bite sized pieces and steamed and thin ribbons of fresh basil. It was a hit with everyone. And you’re right, 24 hours of marinating made this salad sparkle. Worth the wait! I made this last night to have for lunch today at work and it was DELICIOUS!!!! Perfect for a hot summer day!!! Another winner Susan! Thank you. I made this dish on Saturday night and it still tastes fantastic Tuesday night! Great dish to enjoy during the heat wave. Checking back in to say I just made this, and I was a good girl scout and used a fresh lemon and waited the recommended 24 hours. It is splendid! I did not have any salt in the house so added the zest from the lemon. I was surprised at how good it is without anything salty really. 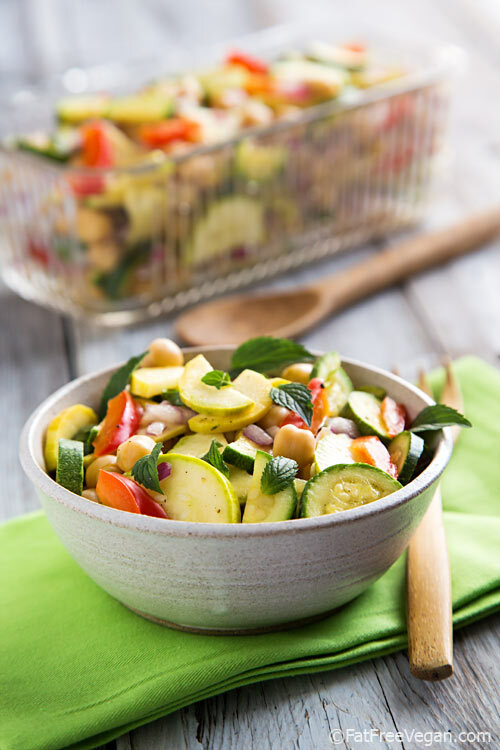 The lemony marinade brings out the sweetness of the pepper and the zucchini. I had cooked my chickpeas with a bit of fennel powder, too.I will make this again. And again. An inspired combination! Looks perfect for summer!! Thank you for sharing. 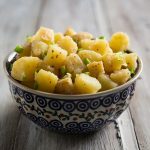 I have just come across your blog and love the look of this recipe, it is definitely something I will try, especially with the hot weather we are having in England at the moment. I am not sure I have any tinned chickpeas though so might replace them with butter beans or cannellini beans. Thanks for the inspiration! Has anyone let is marinate longer than 24 hours? I was thinking about making a batch and then eating it through-out the week. But if the dressing turns everything to mush in longer than 24 hours, I’ll just pre-portion and add the dressing the morning before I want to take the salad to work. Just as a follow up if anyone is wondering, it’s not advisable to leave the dressing on for 4 days as the result is mushy zukes. I ended up portioning out the dressing and adding it to the mixture the morning before I wanted to take it to work and it worked out well. Then I forgot my last serving for a few days with the marinade and well, I ended up eating about 3/4, but it was mushy and not nearly as good. I also have this exact glass dish from my grandmother. I think of her when I use it. This recipe comes at the perfect time, when people keep giving me squash from their gardens. Thank you! I made this and used it as a side dish for a BBQ. It was so delicious I used the remainder on top of romaine lettuce throughout the week for a lunch salad. It was so delicious that way that I’m getting ready to make another batch to use for this week’s lunch! Ooo, zucchini salad. Love this idea. I can imagine how well the lemony dressing soaks into the squash… YUM. 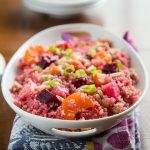 I stumbled upon your website last night looking for new recipes and this is the first recipe I tried and I loved it! So much so that I had it for lunch as a salad and I used it in a wrap for dinner too. I look forward to trying many more of your recipes. Back on your website after a month:) can’t wait to catch up on the recipes you’ve shared since then! Can I use apple cider vinegar for this recipe? It’s the only vinegar I’ve got at the moment. Thanks! Sure! Any vinegar you like will be fine. Hope you enjoy it. Tried this the other day and am very pleased with it. What I had on hand was white wine vinegar and juice from fresh limes. I added a handful of herbs from the garden–minced basil, Italian parsley and mint. After marinating for 2 days the zucchini slices tasted like dill pickles–yum! Mixed with quinoa, it made a nice lunch.